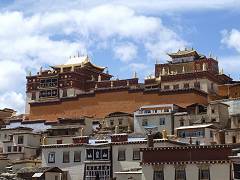 Next morning we left Lhasa & flew to Zhongdian, which has now been re-named Shangri-La. 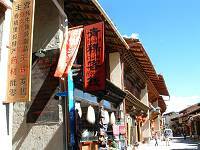 This area is in the northern part of Yunnan next to the Tibetan border, and has a large populan of Tibetan people. 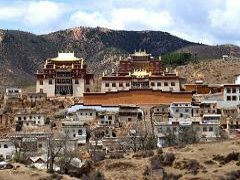 There are Tibetan monasteries & Tibetan houses everywhere to be seen. Our China office director, Tony Deng, drove the 10 hours from Kunming overnight to Shangri-La to meet us again. Tony was going to show us his favourite region in Yunnan. We checked in at the 4* Holy Palace hotel. 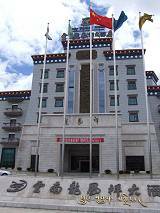 This is a large, new hotel built with a Tibetan influence to the style. Even though brand-new, like most other hotels in China the décor & room seem to us to hark back to the 1950's. We decide to use this hotel in our Superior hotel category. Next we inspected the 5* Paradise hotel. 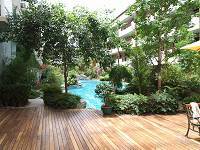 This is a very good standard 5* hotel with lovely swimming pool & inner gardens like a tropical beach resort. 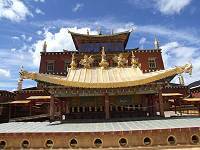 The white building is divided into two different styles of rooms, Tibetan & European, to choose from. Both types of rooms are beautifully designed & furnished. 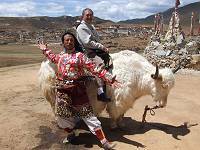 The European is modern & elegant while the Tibetan is traditional & beautiful. We are using this 5* Paradise hotel as our Deluxe hotel category. We got back into our car & drove on up to the monastery. The most stunning view of the monastery is when our car was driving along the road to the monastery. On top of the perimeter wall there are two golden Chinese pagodas. It was like going up towards heaven. The strong early afternoon sun lit the golden roof like a shining torch. It was magical. I still remember the moment that sight hit me. From the entrance to the top of the monastery involves about 200 steps. It is worth the hard work when you arrive the top of the steps, the view of the surrounding valley & the mountains is wonderful. I felt like I was top of the world. When we reached the roof of the golden temple the beauty & the power of the golden roof was overwhelming. It was shining in the sun like magic. There is also a huge golden bell sitting at each corner of the wall. I felt like I was entering a magical & spiritual kingdom. We visited the resident 'living Buddha' who touched our head with prayer while we knelt in front of him. On the way out of the monastery we met a young Lama aged 10 years old. Tony asked him how long he has been in the monastery, he replied 3 years. Tony asked him again how long he is going to be here. The young Lama replied 'the whole of my life' without any hesitation. We returned to town & visited the old town of Zhongdian. The old Chinese houses are still there but many are now turned to shops & restaurants as part of the regeneration of the old town for visitors. Luckily the commercial side of it has not destroyed the old houses as almost all the shops are kept within the traditional house premises. 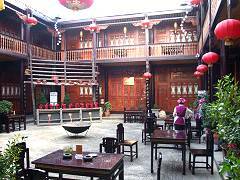 Some of the restaurants have beautiful Chinese inner garden courtyards at the centre of the house. After the old town we checked in Gyathang Dzong hotel for our second night in Shangri-La. 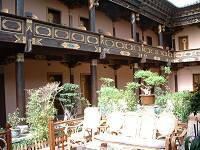 This is a boutique hotel deckorated in Tibetan style, and is now managed by Banyan Tree group. 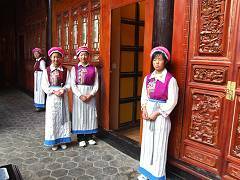 This is not a luxury hotel but it does have beautiful décor & room design, and the restaurant & reception in traditional Tibetan style are simply wonderful. 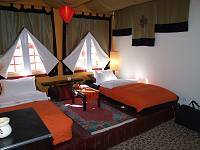 We are using this as a boutique hotel for those who wish to stay in Tibetan style, even though the hotel has no official star rating. Tonight our local representative in Shangri-La took us to a beautiful local restaurant in the old town, the Da Li Inn. This is a traditional old house dating back several hundred years with a beautiful inner courtyard & rooms on all sides of the courtyard. The rooms on the ground floor as well as on first floor are used for dining. In China most diners come in groups, and prefer private rooms for their eating, entertaining etc. This is a very common practice. For small parties there are small tables for 4 in the lovely courtyard. 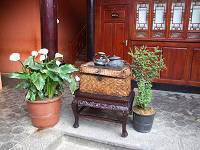 The courtyard was beautifully decorated with red lanterns, pot plants & a display of roast pig on the wooden stand at the corner of the courtyard. The restaurant was beautiful & was the food. We had chicken soup, salted pork, bamboo leaves with pork, mushrooms & my favourite Do Giang (young leaves of green bean). This was served not with rice but with steamed bread. We washed it down with local beer & Chinese rice wine. As darkness fell, the red lanterns lit up the courtyard beautifully like a classic Chinese garden.